Hey everyone! 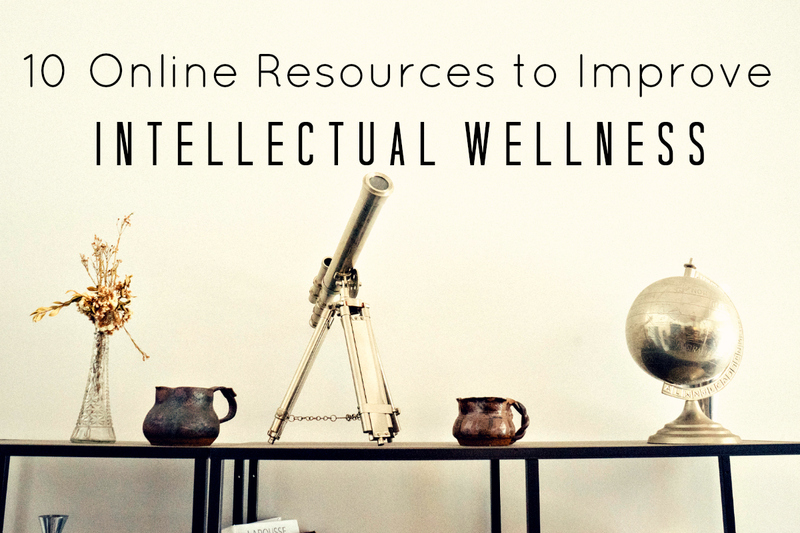 This week, as Part Four of the How to Create a Wellness Lifestyle series, I’ll be talking about my favorite topic- intellectual wellness! I am a curious, researcher type by nature and just love to learn new skills, debate ideas, and take on big challenges. And that’s what intellectual wellness is all about! By being healthy in this area of life, you will expand your knowledge base and nourish your creativity. This makes all areas of life more deep and vibrant! 1. Learn to meditate. Curious about adding meditation to your life, but have no clue how to do it alone? Try out the Headspace app (on your phone or computer) and learn how to meditate. The app will guide you through ten different meditations, and you’ll find your mind much clearer by the end of the experience! 2. Learn time management. Try using the Pomodoro Technique in order to better your time management skills. Keeping track of “to-do” list items and being able to manage distractions are very important signs of intellectual wellness that Pomodoro can help you improve upon. 3. Learn about your inner artist. Check out this free, creative workshop video series called Total Alignment where you learn how to connect your mind-body-soul with your inner creativity through painting. What could sound any more amazing to me?! Even if you feel like you’re not artsy, or you’ve never painted before in your life, this is for you. It’s a series to explore your heart and have fun making things! 4. Learn about money. Learn something new about stocks and investing! Sounds boring, but stay with me… I found the MOST AWESOME way to teach you the basics- behold An Illustrated Guide to Investment Types based off of Arrested Development cartoons!!! Check out the rest of Listen Money Matters to learn more about personal finance in simple ways. 5. Learn a new language. Want to learn languages fo’ free in a super fun way? Duolingo is all that you need in this world. It offers 8 common languages right now and teaches you in a way that feels just like a game. I’ve started on the Spanish and German classes, and it’s truly addictive- I just want to earn more grammar trophies!!! 7. Learn how to code. We’re in the 21st century, guys, and computers aren’t going away. Tech jobs are on fire right now, and you don’t even need a computer science degree to land a position- just awesome coding skills. So where can you start learning? Codecademy. It offers an interactive, easy-to-learn style with several coding language options. Even if you don’t want a job in the tech field, Codecademy is a great way to stretch your brain! 8. Learn about achieving your goals. Everyone needs some career advice and a motivational push every now and then. Marie Forleo was that person who inspired me to get into this line of work a few months ago on her popular, online show called MarieTV. Every week, she gives quirky but relatable life advice on topics such as: Thank You For Not Believing in Me and The Mental Exercise That Can Turn Wishes Into Reality. She also does awesome interviews with expert guests that you should check out if you’re needing some positivity in your day! 9. Learn yoga poses. If I haven’t jabbered about it enough for you to guess, yoga is one of my favorite activities to do on a regular basis. What many people who’ve never tried it don’t realize is that it’s a full mind-body-soul experience. I would definitely recommend trying Do You Yoga to learn how to do many different yoga poses and sequences at home. All you need is a yoga mat (or even a rug) and comfy clothes to do it anywhere and reap the amazing benefits! 10. Learn about academic topics. Coursera is a phenomenal learning resource that partners up with 114 different academic institutions, including Harvard, Duke, Berklee College of Music, and University of Virginia, to offer real, online classes for free. How cool is that?! There are over 800 different course options- Intro to Sustainable Development, Calculus 1, Introduction to Music Production, and much more. The world is at your fingertips on Coursera… learn it up! So which of these resources do you think would be the most fun to get involved with? Which ones pique your curiosity and get your brain juices flowing? I hope that you’ve found my post to be intellectually inspiring! If so, please “like” and share it with any of your friends who would love to read it too! This entry was posted in Health // Wellness, Inspiration // Empowerment, Things I Love // Recommend and tagged coding, goals, intellectual, investing, language, learn, meditate, painting, study, wellness, yoga by Caylee. Bookmark the permalink. Great post! Even though I’m still working on my PhD, I’ve been learning online for months now via Udemy. I get to learn awesome stuff like hand-to-hand combat and grant-writing! For an even bigger intellectual wellness leap, folks can create their own courses. It’s been awesome to consider what skills I have and what I can teach others, and teaching is a great way to continue learning!